Code-switching is broad term referring to the alternation between two or more languages, dialects or styles, within and between utterances and sentences. When it comes to linguistic creativity, code-switching provides a wealth of opportunities for the speaker, beyond those available in any single language or dialect. As well as being a creative mechanism in literature, music and film, it’s also a very creative tool for selling things – in branding, marketing and advertising. And, as I also hope to show, code-switching in advertising is not something that requires fluency in a second language. Au contraire. Even people who would call themselves monolingual are probably more used to code-switching than they think – so much so, in fact, that they have probably stopped noticing how often the ‘(M)ad Men’ use it to tempt us. The text of the advert combines grammars, as well as words, from both languages. It also cleverly employs words like ‘so’, ‘warm’ and ‘in’ which are lexical items in both languages; this helps reduce the effort required by the reader to understand what is written, at the same time maintaining the pervasiveness of the English throughout the text. If you travel anywhere outside of the Anglophone world – from Chile, to Kenya, to Beijing – you are likely to find similar examples. On a recent trip to Russia, it was noticeable that many restaurants in downtown St Petersburg and Moscow had Russian-English names, often switching languages in their signs (‘Restoran Meat Head’ was a particular favourite, and not just for the steak). And code-switching wasn’t only to be found in the catering sector. The business newspaper I picked up in Moscow airport was called the ‘RBC Daily’, which even switches scripts (from Cyrillic to Latin) in its title. Here, of course, (American) English is evocative of international business and commerce. But code-switching is prevalent in the Anglophone world too, and English speaking consumers like me are just as likely to be taken in by it. In the UK at least, French is especially common, partly because it is traditionally the most taught second language, but also because of the perceived attractiveness of the French lifestyle – and its connotations of elegance, sophistication and taste. As such, French is used to sell everything from cars and clothes, to perfume and beer. Such a tagline, of course, cleverly hinges upon the (perceived) superiority of everything French – including the language itself. For obvious culinary reasons, the restaurant industry is arguably the place where code-switching to French is most common. 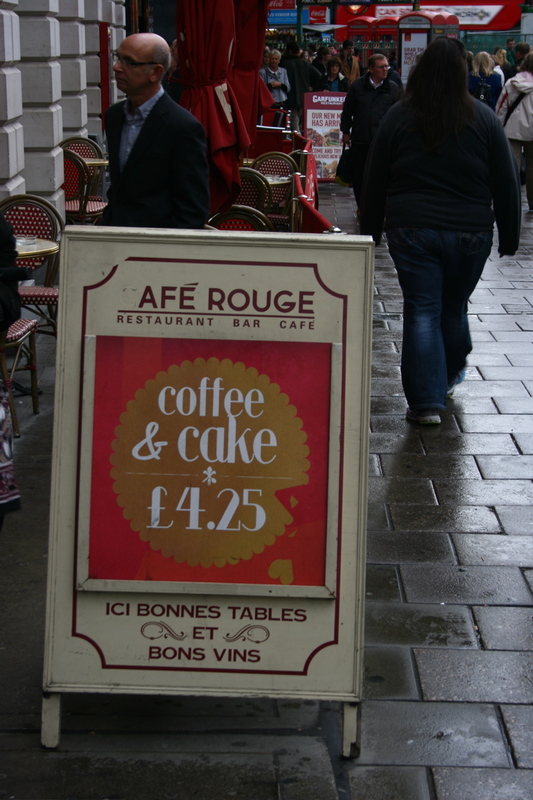 Walking around any English speaking city, you’re likely to find plenty of French: here, a chain of French restaurants advertising ‘bonnes tables et vins’; there, a bistro advertising its ‘plat du jour’. If you’re an English speaker in the Anglophone world, you’re perhaps most likely to see code-switching in restaurant menus. And you see it so often, in fact, that you’ve possible stopped noticing it. Take, for example, the menu for the Michelin-starred La Chappelle restaurant in London. The majority of the language may look like English, but the register is decidedly Francophone. Starters are labelled ‘Entrées’, main courses as ‘Plats principaux’. Appetisingly, there’s ‘ballotine of quail’, ‘pavé of halibut’, an ‘assiette of Herdwick lamb’ (what’s wrong with ‘plate’? ), and ‘summer vegetables en cocette‘. There’s certainly a soupçon of code-switching going on, and that’s only in the à la carte menu. Because of the status in Europe of French cuisine, French has dictated much of the English vocabulary for food and drink (‘restaurant’, ‘bistro’, ‘café’, ‘menu’, and so on). As such, it’s worth being careful to differentiate between code-switching and lexical borrowing. In borrowing, a ‘loan word’ is taken from a donor language and incorporated into the recipient language. However, in practice, it’s quite difficult to separate the two phenomena. In reality, there is a continuum between the two extremes: loans start off as code-switches and then gradually become established phonologically, morphologically, and so on, into the lexicon of the recipient language (Gardner-Chloros, 2009). For example – for most English speakers I know at least – ‘restaurant’ is a fully fledged ‘English’ word. However, there are still certain speakers, usually from among the British upper classes, that refuse to accept its English phonology. They still pronounce ‘restaurant’ en français, without the terminal /t/ and with the final consonant Gallicly nasalized. That is, they refuse to borrow and, instead, are absolutely resolute in their code-switching. Code-switching to another language like this can be used, of course, as a device to demonstrate how sophisticated we (think we) are. Interestingly, I once heard a particular member of this group – a food critic on a popular TV cooking competition – pluralise the phonologically-French ‘restaurant’ by adding a terminal /z/, as in English. Critics might say that this particular speaker, in an overtly pretentious effort, was failing to be as clever as he thought he was(!). Technically speaking, you would say within the speaker’s own idiolect the integration of ‘restaurant’ was complete morphologically, but not phonologically. But, whatever you feel about code-switching in advertising – sophisticated, pretentious, or simply unnecessary – you can’t disagree that it’s everywhere. In fact, it’s so ubiquitous, that it’s very easy to stop noticing that it’s there at all. Since, when it comes to the business of selling, there’s nothing like a bit of code-switching. Often, the difference is at least a few extra bucks. There’s a short blog and interesting video about code-switching in advertising here (http://lindazonderop.blogspot.co.uk/2011/06/code-switching-in-advertising.html). Gardner-Chloros, P. (2009) Code-Switching. Cambridge: Cambridge University Press. This entry was posted in Uncategorized and tagged advertising, code-switching, creativity, english, food, french, german, language, linguistics, restaurants. Bookmark the permalink. While code-switching for a single word is certainly possible, non-nativized loanwords don’t, IMO, constitute it. The German word Chance, for example, is still pronounced /ʃɑ̃sə/ rather than /ʃɑnsə/ even after being in the language for centuries, but it is firmly German, with the distinctive plural Chancen, parallel to other weak feminine nouns. Nor am I code-switching when I refer to Johann Sebastian /bɑx/; that is simply his name to me.